Here are some great examples of how not to promote your self-published book. These are actual emails that I received from complete strangers. I have removed the book titles and the names of the authors to save them embarrassment. My third novel, XYZ. is now available for review. If you would like a review copy, I will gladly send you one. My novel 'XYZ' is now available on Amazon's Kindle (PC, Mac, Blackberry, Android, Iphone, Ipad) It is also available directly from me as a pdf file @ XYZ. The paperback edition will be available next week on Amazon. Let me know what you think! I wrote XYZ as pure entertainment.Sure, it's a vampire story. But it's set in Las Vegas, and it's told in short, cliffhanger chapters full of dialog and action. Just read the first 4 chapters (like I said, they're short), and if you're NOT hooked, then let me know and I'll leave you alone. My book XYZ is out. You can buy it here (XYZ). Please promote it on your blogs and sites. Of course I will. But why stop there? Could I also pass out fliers on your behalf? Or maybe make some cold calls? Let me know. I am at your service. Jeffrey Trachtenberg of The Wall Street Journal reports that authors are getting screwed by publishers in the ebook business. It has always been tough for literary fiction writers to get their work published by the top publishing houses. But the digital revolution that is disrupting the economic model of the book industry is having an outsize impact on the careers of literary writers. […]The new economics of the e-book make the author's quandary painfully clear: A new $28 hardcover book returns half, or $14, to the publisher, and 15%, or $4.20, to the author. Under many e-book deals currently, a digital book sells for $12.99, returning 70%, or $9.09, to the publisher and typically 25% of that, or $2.27, to the author. But Trachtenberg leaves out an attractive third option (and I have no idea why he did). What he doesn't say is that an author can publish their ebooks to the Kindle themselves and earn 70% of whatever the purchase price is ($2.06 on a $2.99 ebook). So why even bother with a publisher? I know it's a question more and more mid-list and literary authors are asking themselves. I certainly am. The problem here isn't the rise of ebooks…it's publishers that are a) charging too much for ebooks and b) not giving a fair royalty on ebooks to authors. In other words, it's not ebooks that are the problem here, it's the publishers failing to adapt. In case our first REMAINDERED posters are too “violent” for some venues or publications, our ace graphic designer Brian Bolin has put together these two mock-ups for an alternative poster. What do you think of’em? (The picture quality will be sharpened on the final posters). When the cops arrived ten minutes later, I told them the guy was late 30's, 6-1, 190 pounds, bleached spiked hair and spoke with a Russian accent. The car, I suggested, was possibly stolen. Maybe owned by a woman who was a life insurance broker in Orange County. She might need assistance walking, and it's possible her initials are "L.F."
The cops gave me sideways glances. Like who the hell was this guy, "The Mentalist?" I explained. The license plate holder is from a dealer in Anaheim. In the front seat, there's a blue handicapped parking sticker and a hardcover book. Married Lovers by Jackie Collins. Men don't read her. The personalized license plate is "LF CLU." "Her name might be Lois Fenstermacher," I suggested, helpfully. "And she could be a Chartered Life Underwriter." A Sequel to THE WALK? But first, a little background for those of you who haven’t read it. The book has sold over 10,000 copies since I made it available for the Kindle back in June 2009. In the book, Los Angeles is flattened by an earthquake and a guy stuck downtown when it happens sets off to walk across a landscape of devastation to get back to his wife, who is at their home in the San Fernando Valley. 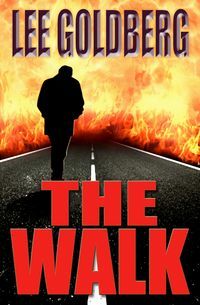 My wife thinks I should write a sequel, exclusively for the Kindle, to THE WALK, set over the same two days, except told from the wife’s point-of-view and revealing what she was going through while her husband made his journey. What do you think? Would you be interested in reading that? It’s been almost two weeks since we wrapped REMAINDERED and yesterday I was finally able to see — after some tech problems and delays — all of the footage we shot and an editor’s assembly of most of the movie (minus one scene). I am extremely happy with what we’ve got and thrilled with the performances by the entire cast. The cast and crew did an amazing job….far exceeding my expectations. Today I sent the editors — PJ Starks and Rodney Newton — detailed notes on all the scenes and now I am eagerly awaiting their next pass, which I hope to see in bits and pieces over the weekend and into early next week. Hopefully, we can get the film locked next week so we can start working on the sound & music mix. But this editing from afar is extraordinarily frustrating for me. I’m back in L.A. and the editors are in Owensboro, Kentucky. I’d much prefer to be able to sit in the editing room with them while they do my notes…as I have on the hundreds of hours of TV that I’ve produced. If things bog down too much, either on the editing or the mix, I’ll fly back for a weekend and work with them to get it done in time for our Oct. 16 premiere screening at Bouchercon in San Francisco. While reviewing the footage and the editor’s assembly, I was struck again by something writer/producer Michael Gleason taught me. You have four chances to make your show. There’s the show you visualize in your mind… there’s the show that’s created in the script that you write….there’s the show that’s created in filming…and there’s the show that’s created in editing. There can often be a considerable difference between each of those creations…and each stage offers you the chance to “rewrite” the story, if not on the page than in the performances, the shots, and in the final editing. The movie isn’t exactly what I imagined when I wrote the REMAINDERED short story or the script. Surprisingly, in some ways, Lee the Writer and Lee The Director ended up being two different people with sometimes differing takes on the material. I found myself changing the tone to some degree, and the characters, in the way I directed the actors and in how I chose to shoot it… and, now, in how I am choosing to edit it. It’s been fascinating and fun for me. I found that directing was like writing with cameras. I was surprised by how clearly I saw the movie in my mind when it came time to actually shoot it. I knew exactly what shots I wanted…which helped me make my days (time-wise and budget-wise) and made it easy to decide which of my crew’s clever ideas to accept or reject. I made some mistakes, of course. There’s one shot I’m kicking myself for not getting (I didn’t think I needed it and I was wrong) and one scene I wish I’d staged a little differently in the master (but it’s not a big problem). There was one location I wasn’t able, for various reasons, to see with my own eyes until we shot there (I approved it based on photos). The location was a big mistake in so many ways, but we were able to cheat it, thanks to the cleverness of my “indie” crew. It works, though not nearly as well as I would have liked it to. In that same scene, there was one seemingly simple prop I didn’t see until it was time to shoot it…and took for granted that it would be right… and, of course, what I got was totally wrong. We had to cheat that, too, but we made it work, though again not nearly as well as it would have with the right prop. We overcame all those issues… and made a film I know that I am going to be immensely proud of. But I learned an important lesson from making those mistakes, all of which were entirely my fault. Next time, no matter how overly meticulous or controlling it may make me seem, I’ll make sure I see every single thing in advance and not take anyone’s word that something was done the way that I wanted it to be. I will need to verify everything. Oddly enough, my biggest mistake was on an issue not related to filming. I didn’t personally see to it that we had an on-set photographer to take production stills… and that mistake has become a real problem for us now as we’re preparing our publicity. We have hundreds of behind-the-scenes production photos taken by crew people…but we have only four…yes, you read right, four…pictures that could be considered production stills (scenes in the movie). And those were taken by chance by a member of our crew. We could use frame grabs, but since we didn’t shoot this film in high-def, the quality is going to be poor. But those are all minor quibbles in what was a fantastic experience with a great crew of talented, and hard-working, local actors and film-makers. I loved directing and can’t wait to do it again…and maybe, if I am lucky, it might be with the same group of people. Could Konrath Become the First Kindle Millionaire? 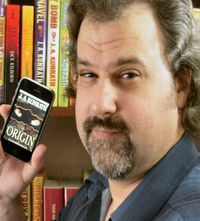 Everyone knows that Joe Konrath’s books are doing remarkably well on the Kindle. But the actual numbers are astonishing. He’s sold 103,864 ebooks across all platforms since 2004…78,000 of them on the Kindle. Here’s how his numbers break down…and for comparison’s sake, he’s included both his self-published and professionally published books. So what does all of this mean to the home viewer? Currently, I’m selling an average of 7000 self-pubbed ebooks a month on Kindle. My best selling Hyperion ebook, Whiskey Sour, has sold 2631 ebooks since 2004. That’s earned me about $2200, or $34 a month since it was released. $34 a month per ebook is a far cry from the $1700 a month per ebook I’m making on my own. So I’m basically losing money hand over fist because Hyperion is pricing my ebooks too high, and giving me too low a royalty rate. Even the print sales (Whiskey Sour just went into a fifth printing) don’t come close to making up the money I’m losing. Let’s multiply that times the six books Hyperion controls. I’m estimating I currently earn $33,696 annually in ebook royalties on those six. If I had the rights, I estimate I’d earn $102,000. […]I’ll end 2010 having earned over $100k on my self-pubbed ebooks, and that’s nothing compared to what I expect to make in 2011. And I’m doing it without touring, without promoting non-stop, without spending a lot of money, and without relying on anyone. It’s no wonder that Joe has opted to focus his literary efforts almost entirely on ebooks and to turn his back, for the most part, on NY print publishers. Financially for him, it’s a no brainer. I have to admit that Joe’s experience — and, to a lesser degree, my own — are changing some of my long-held beliefs about the publishing business. And it’s also made me think twice about whether I should write my next book for a publisher… or for myself, a thought that never would have entered my head a year ago. 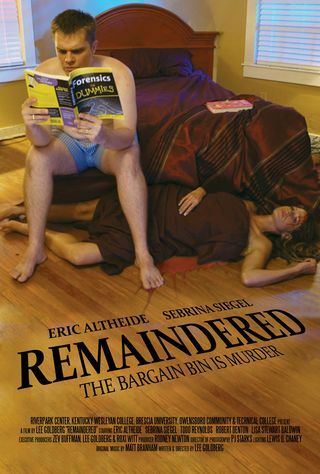 Here's the preliminary movie poster for REMAINDERED, designed by Brian Bolin and featuring a photo by Neil Kellen.